Preregistration is the first big badge sale of the year, and the first chance for attendees to try for their chance at a golden ticket. The team took covered the event live, discussing breaking news, what the sale means for future badge events, the high and low points of the sale, and much more. The convention is over, so before we start hybernating looking forward to next year, the team drops their top five favorite moments of San Diego Comic-Con 2014. Plus we cover our disappointments of the convention, and read some of our readers top moments! If you didn't turnout for the live feed on Google+, you can watch it below. If you were, thanks for your questions! Make sure you listen to the audio version below, because each week we'll give everyone some bonus content that isn't available on the live video feed. The team gathered in the Plaza on Friday night to recap the last two days of Comic-Con. Hear tales of Shawn's exclusives hunt, Kerry's Teen Wolf-themed Comic-Con; Jeremy's induction into Sharknadia; James' work week and more. Want to feel what it's like to be inside Hall H? Maybe you weren't able to attend this year, or you just want to relive that feeling over and over and over again? Not to fear, we have just the thing. We tried something new this year - we created binaural (3D) audio recordings to fully immerse yourself inside Hall H. These audio recordings are best meant to be listened to with headphones. So sit back, dim the lights, close your eyes and travel back into Hall H. Or listen to the recordings while watching the POV video. It's a great SDCC experience that we can now bring you wherever you are. Comic-Con is one week away! And we couldn't be more excited, because Zachary Levi and David Coleman will be joining us live to discuss this year's Nerd HQ plans, Conversations line-up and more. If you're excited to hear more about Nerd HQ, and who isn't, you'll definitely want to tune in. CONTEST: Win a ‘Musical Anatomy of a Superhero’ Superhero Super Pack - Enter by Sunday July 20 11:59pm PT! The SDConCast is back with its third annual "Breaking Down The Schedule" episodes - the most comprehensive Comic-Con schedule analysis you'll find anywhere. Join Jeremy, James, Kerry and others as we look at what's scheduled for the main panel rooms on Saturday and Sunday (you can listen to the Preview Night, Thursday and Friday schedule breakdown here); give insight and analysis on how you can get into the big panels; and give our dark horse picks you can use as your back-up choices - or even your main one! Got a question? Join us live and ask us via the Q&A app, or tweet us at @SD_Comic_Con with hashtag #SDConCast , and we’ll answer them on air. And if you aren’t able to join live, you can always watch the broadcast recording on YouTube, or subscribe/stream the audio version (with bonus content) to listen to over the weekend. The SDConCast is back with its third annual "Breaking Down The Schedule" episodes - the most comprehensive Comic-Con schedule analysis you'll find anywhere. Join Jeremy, James, Kerry and others as we look at what's scheduled for the main panel rooms on Preview Night, Thursday and Friday; give insight and analysis on how you can get into the big panels; and give our dark horse picks you can use as your back-up choices - or even your main one! The SDConCast team returns for another week of Comic-Con talk. We get asked why we don't cover comics more than we do, so we're bringing back our friend Heidi MacDonald from The Beat to talk about the latest in the comics industry, her thoughts on the convention and how comics fans can make the most of their SDCC. Got a question? Join us live and ask us via the Q&A app, or tweet us at @SD_Comic_Con with hashtag #SDConCast , and we'll answer them on air. And if you aren't able to join live, you can always watch the broadcast recording on YouTube, or subscribe/stream the audio version (with bonus content) to listen to over the weekend. Of all the guests we've had on the SDConCast over the years, we're excited about this one the most. Joining us will be Doug Kline, who literally wrote the book on Comic-Con. As author of The Unauthorized San Diego Comic-Con Survival Guide, Doug kicked off the SDCC fan movement of which we now play a big part. Please join us as we talk about Comic-Con over the years, and get the dish on the ultimate tips and tricks for those attending SDCC, whether it's their first time or their tenth. You won't want to miss! If our posts on the television shows you might be seeing in Ballroom 20 got you excited for SDCC this year, then you'll definitely want to tune into this week's SDConCast. We'll be joined by Eric Goldman, Executive editor for IGN.com, where we'll go through the new and returning television shows, as well as provide our commentary on the Comic-Con news of the week - of which there is no shortage, mind you! We're very excited for this week's episode of the SDConCast, because it's one of our favorite subjects to talk about regarding San Diego Comic-Con - movies! We posted our guesses as to which movies you might be seeing in San Diego this July, and we talked with returning SDConCast guest Germain Lussier, Writer for Slashfilm.com, on what he is expecting. Some surprises, some reveals! But we guarantee, you'll be ready to line up for Hall H after listening. You'll be able to take part in the SDConCast by joining us live each Thursday at 9PM ET / 6PM PT and submitting your questions. 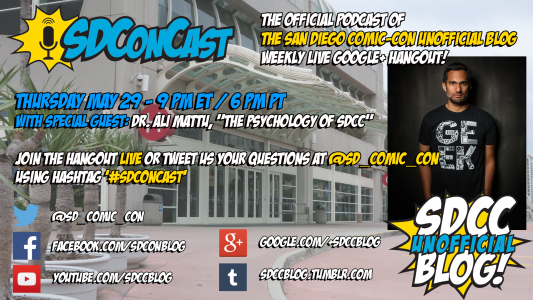 You can also tweet your questions to @SD_Comic_Con with the hashtag #SDConCast anytime before the broadcast and we'll answer them on air. If you're not able to join live, you can always watch later on YouTube, or subscribe to the podcast via RSS, iTunes or Stitcher and receive some bonus audio-only content. Sign up for our Mailing List to receive weekly updates and exclusive news! We're very excited to announce our first special guest of the season, Dr. Ali Mattu from brainknowsbetter.com. 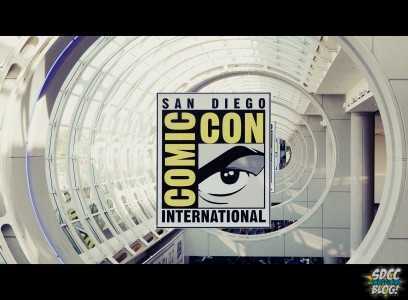 He is joined by the rest of the team from The San Diego Comic-Con Unofficial Blog to talk about The Psychology of Comic-Con, as well as the SDCC news of the week and other geeky pursuits. Today starts the unofficial start of summer, with Memorial Day (in the U.S., for our international readers) finishing off our upcoming three-day weekend. What are our plans? James is hanging out in Minnesota (and watching X-Men: Days of Future Past), Jeremy's finally going to see Godzilla, Kerry will be re-living The Truman Show, and Sarah's going to be staying right where she is. Literally. Like, she won't be moving from her seat until next week's podcast. Or so she claims. This week with James chillin' in the North, Kim has returned to the podcast to talk with us about the parking pass sales and offsite events, and on a more serious note we discuss the impacts from the recent San Diego brush fires. We also take a closer look at the new exclusive announcements from NECA and Hasbro. If you didn't turnout for the live feed on Google+, you can watch it below. If you did, thanks for your questions! Make sure you listen to the audio version below, because we gave everyone some bonus content that wasn't available on the live video feed. It's May, and that means it's time for the return of the SDConCast, the official podcast of The San Diego Comic-Con Unofficial Blog. For those of you who are new to the blog and the podcast, the SDConCast is where the blog's team members get together weekly to discuss the big news items, catch up on their individual geeky activities, and help prepare listeners for the convention. For this first episode of "season three", the team talks about the recent news regarding the badge resale (and lack thereof), the big exclusives for this year announced so far, and Jeremy professes his love for The Amazing Spider-Man 2. Not. He does seem to have a man-crush on Dane DaHaan, apparently. SDConCast Saturday Wrap-Up Show - Live from WonderCon! What better way for the team to spend Easter weekend than to descend upon Disneyland Anaheim for WonderCon 2014! Saturday's programming schedule was very SDCC-like, with big Hollywood and television network panels. Godzilla! X-Men! How to Train Your Dragon 2! And much more. Kerry assembled the troops - Shawn and Kim specifically - for this special Saturday "wrap-up" episode live from WonderCon. The hotel lottery is behind us (for now), but with WonderCon right around the corner there's good times ahead. Listen to Kerry, James and Jeremy as they talk about what happened during "Hotelpocalypse 2014" and break down the WonderCon Anaheim programming schedule to bring you the highlights and dark horse picks for each day. And, did we mention our First Annual WonderCon Reader Meetup? Oh we did? Good. See you there! Vote for James and Beth (Geekshot Photography) for "Best Photographer" in the Steampunk Chronicle Readers Choice Awards!